When I moved to a town known for its military base, I laughed and swore to everyone back home that I would, under no circumstances, marry someone in the military. And not because I had anything against them. More like, I didn’t believe I was the “type” of girl who could ever handle the military life. Six years and countless “I told you so’s” later, here I am—married to a man in uniform and raising up our two babies. Looking back to when we first met, I couldn’t help but look past what he did for a living. I just saw him for who he was. Admittedly, I don’t think some of us purposely search to marry a man in uniform because we know what that sacrificial life entails. But when the right one captures your heart, it’s hard not to surrender and let them keep it. Even though you know that they are owned by the military, and even though their loyalty is to the military over anything or anyone else, even you. In fact, the only predictable thing about military life is that it is absolutely unpredictable. And sometimes, just when you think you’re getting a handle on this whole military lifestyle, your husband is volunteered (we call it volun-told) to do a special duty operation. As military wives, we know these duties call for way more hours than the set 9-5. One year I had to take our kids to visit his in-laws six hours away by myself because he had to work every day of Christmas week except for Christmas day. It’s so hard to explain to family and friends why he doesn’t show up for important events or holidays when he’s not even technically deployed. It certainly isn’t because he wants to miss out on everything, but it has everything to do with his purpose. …the only predictable thing about military life is that it is absolutely unpredictable. Lt. Col. Dave Grossman wrote a parable he once heard from a Vietnam veteran that says there are three different types of people in the world: the sheep, the wolf, and the sheepdog. Most of us are the sheep. We live our lives rather gently, peacefully, and productively. The wolves feed on the sheep. These people are evil and capable of evil deeds. We cannot deny that they exist in our world. But the sheepdogs, those are our men and women in uniform. They are the ones who have a deep desire to “protect the flock and confront the wolf.” And so they do. They do it because deep in their hearts, that is their life’s purpose. It took me longer than I care to admit to understand that my husband is like the sheepdog. I think it’s safe to say that we all go in with the best of intentions to be the most supportive wife to our service members, but then, even after just a year it can take a toll on you. Sure, we could fight for our husbands to stay home, safe and sound, taking care of just our own little families. But all that does is disrespect our men in uniform and everything they are. So we choose to fully support what they have been chosen to do and force ourselves to be as strong as they are. Even when he tells you six months after you get married to him that he’ll be deployed for the following six months. 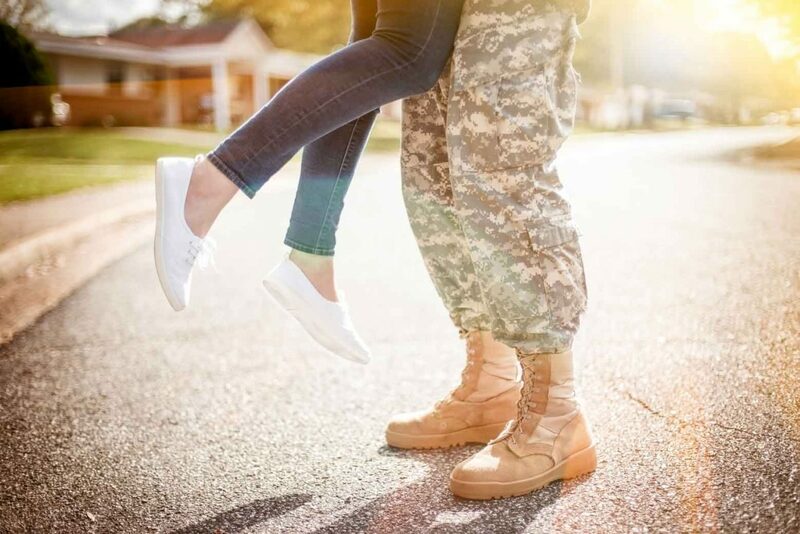 Even when he’s leaving for his deployment and you say goodbye, holding back the tears to prove that you are cut out for this lifestyle after all…but only because you just have to be. Even though you cry harder than you ever have in your entire life the second after he leaves, but then pick yourself back up so you can go to your own job for the day. Even when your children never really understand where he is, why he’s gone, and always ask when he’s coming home…though you usually don’t even know the answer either. Little by little, we learn that those boots have gone places we will never have to go and the best thing we can do is just hold on more dearly to the freedom that they are so bravely fighting for. In doing these things we truly acquire the armor of “grit and grace” that we so desperately need to keep us going as military wives. It becomes the essence of who we are. Yes, we are called dependents, but ironically we become some of the most independent women I know. Yes, we are called dependents, but we become some of the most independent women I know. You’ll also like Married to the Badge: Not Your Typical Life, Anatomy of a Strong Woman, A Really Different Kind of Family, Infertility Is an Interruption, but Not the End, and The Grit and Grace of a Baseball Wife. Allie is a proud Marine wife and mama bear of a roaring little boy and twirling little girl. She is whole heartedly a coffee and wine enthusiast. Although she is an educator by trade, in her rare moments of free time you can find her at the beach aspiring to be a mermaid.